It is our motto that every client receives the highest standard of service delivery within a relaxing environment with a good selection of quality products at an affordable price. We want every client to enjoy good value for money while visiting us.The property was awarded a 4-star grading hence its levels of service delivery, good quality food & beverage with comfortable accommodation and a selection of hotel facilities, such as an award-winning beauty spa and function venues. All this near town centre Middelburg and the N4 Highway running between Johannesburg/Pretoria and Nelspruit. The Manor Room is open to the public and serves a good selection of hearty meals. We are proud of the English culinary cuisine that is fused with a South African flare making the dishes more elegant but with substance. The Manor Room is open seven days a week from morning to evening and we highly recommend our romantic dinner packages.The wine list comprises of only South African wines with a decent selection of white and red wine options.Our kitchen serves only freshly cooked meals and most of the herbs comes from our own herb garden making the dishes tastier. With a selection of venues to choose from the Alveston Manor is the perfect setting for your next event. We really strive to ensure that all your needs are met and that of your guests are catered for as much as possible. We hire in décor if we don’t have it or you can even arrange your own to suite your needs and budget. We believe that every event must be a successful event for the host. Our food is always fresh and cooked to your liking. If we can’t make it then I doesn’t exist as our chefs are fully qualified to serve you guests the best meal of the night. The bar is well stocked and we will gladly buy in on special request. Choose between three inside venue areas or an outside marquee function might be the best setting for your special occasion. If it’s a birthday party the whole family is welcome, from small tots to more wisely who will enjoy our lounge area. All corporate launches with a stand-up reception make the Alveston Manor your perfect place to showcase your product or service. When it comes to mind, body and soul rejuvenation the only place in Middelburg to visit is the Alveston Spa. We have the perfect setting to ensure every guest leaves in a different state of being and this is a positive thing in a world filled with stress and distractions. You will find that all our therapists are very experienced and fully qualified to do what they do best and that is to labour with love to ensure you relax completely. We offer only spa treatments with the added beauty elements that will enhance your experience. The spa is fitted with a selection of hydro elements and ultraviolet treatments to add to your overall relaxation. The best products ensure clients receive the best treatments and therefore we only buy quality products with healthy properties. If u are looking for a romantic, beautiful, private, and did I mention romantic getaway for u and your spouse then this place is fantastic, the price is fantastic, the atmosphere is fantastic, the spa treatments are so romantic and the ladies are so fantastic, the specials are amazing, my husband and I had a fantastic and romantic weekend there, and we are definitely coming back. Value for money ... Excellent!! The staff were extremely friendly and well trained. Greeted us with a smile and friendly service at a beautiful venue. Venue is very well looked after. We enjoyed the room, our room was on the outside and very private. Room was very clean with good bed and good quality bedding. As stated, the venue is really maintained well. We really enjoyed our dinner and breakfast, the food was really good. Like the fact that we could order upon arrival and dinner was prepared and served warm in the dining room. Enjoyed the massages. Although a bit or a misunderstanding with our massages, Eugene sorted it out quickly. 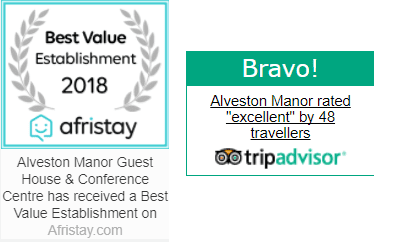 I would recommend Alveston Manor. It is relaxing, quite and not that far from Johannesburg. We will be back !!!! © 2019 Alveston Manor. All Rights Reserved.